Apple got so close to its 27 October "hello again" launch event without leaking too much of the new MacBook Pro - then shot itself in the foot. A leak revealing official photos of the new laptop has appeared in Apple's own recent release of the latest Mac OS. Clever coders have dug into the code of the latest Mac OS Sierra release to find the revealing images of the new MacBook Pro. So what's shown off? 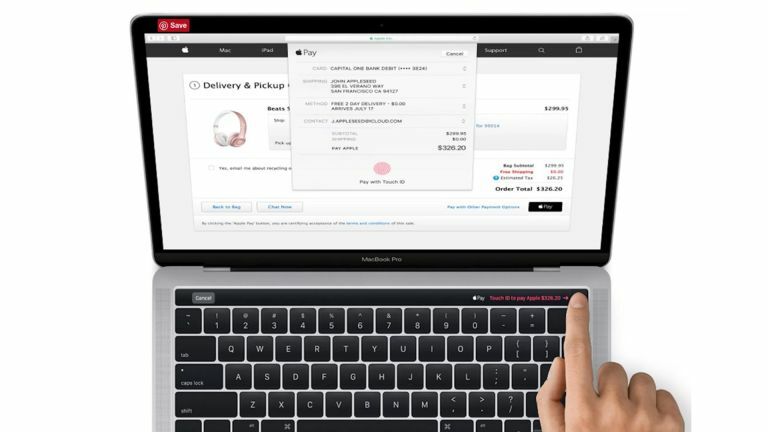 The already rumoured OLED touch bar that replaces the function keys appears to be coming under the name Magic Toolbar. This seems to be able to change to suit what the user needs, be it function touch-buttons, loading status bars and Touch ID. Yup it looks like the fingerprint reader is built right into the glass OLED panel. The main leaked photo shows a finger being held on the OLED panel to activate Touch ID, suggesting it will be used for secure payments online just as it can be on the iPhone. It could also be used to lock and unlock the device. The image also reveals that the MacBook Pro appears to be getting speakers in the edges at either end of the keyboard. Also visible is a redesigned hinge suggesting this new model will be thinner than previous MacBook Pros. Other rumours suggest the new MacBook Pro will come with faster processing, four USB-C ports, HDMI out, a headphone jack, a MagSafe port but will not have an SD reader.